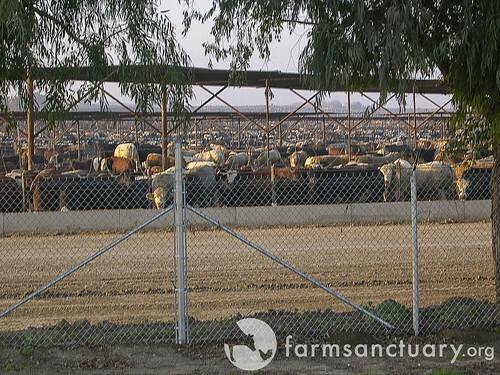 One of the many things that Michael Pollan's food policy manifesto brought into focus (possibly for the first time for many readers) was the massive impact of CAFOs - Confined Animal Feeding Operations - both on the environment and on the food system. Ezra Klein has a good post where he pulls out a relevant quote from Pollan's piece, identifies the climate impact (just confirmed by some new data) and speculates on the tricky implications of fixing this policy disaster, i.e. more expensive meat. But it's worth reminding ourselves of a couple things. The existence of cheap meat produced on vast, inhuman, toxic cities of cattle, poultry and pigs was not the result of some unfortunate but "innocent" market efficiency. This was not the Invisible Hand revealing the inevitable efficiency of this particular style of raising livestock. CAFOs exist because of massive taxpayer subsidies and wholesale regulatory negligence. Meat is cheap by historical standards only if you limit your gaze to the price on the supermarket label. The Union of Concerned Scientists tried to put a price tag on CAFOs in a study released in April. The figures are eye-popping. The study "found that from 1997 to 2005 taxpayer-subsidized grain prices saved CAFOs nearly $35 billion in animal feed" while since 2002 "CAFOs have received $100 million in annual pollution prevention payments." Wow. The study concludes that CAFOs would not be competitive without these props. And then there are the indirect benefits. Gristmill identified a GAO study released in September that looked at the regulatory side of the "subsidy." The EPA and not the USDA is charged with regulating CAFOs. They save the taxpayers billions by... doing nothing. As the GAO puts it in their summary, "the EPA does not have comprehensive, accurate information on the number of permitted CAFOs nationwide. As a result, EPA does not have the information it needs to effectively regulate these CAFOs." That's a shame since, as the GAO observes, "Some large farms that raise animals can generate more raw waste than the populations of some U.S. cities produce annually." You can see the direct effects of the literal vast sea of manure in this Gristmill post about North Carolina's hog farm "problem" - a problem that everyone involved agrees has no real solution short of shutting down the farms and redistributing the pigs to smaller producers. And the surprising effect of the rise of CAFOs isn't just the devastating environmental impact, but the enormous negative economic impact - first CAFOs put small farmers out of business and then they hire them at "an average of $7-$8 an hour with no benefits." Charming. As Wendell Berry has tartly observed, to take animals off farms and put them on feedlots is to take an elegant solution - animals replenishing the fertility that crops deplete - and neatly divide it into two problems: a fertility problem on the farm and a pollution problem on the feedlot. The former problem is remedied with fossil-fuel fertilizer; the latter is remedied not at all. While you may have lost your appetite while reading this, it's not true that the only solution is to go vegetarian (not that there's anything wrong with that). But it's hard to avoid the conclusion that meat can and should become a luxury again. Brilliant. Listening to Pollan the other night on Moyers' program was great too. He spelled out the pricing hypocrisy well and one can't help but be moved by the sorry state in which the animals, and subsequently the land, find themselves. The Great Diaper Debate Resolved?